Hartwell Carson has a lot of stories. Stories about boats falling off of cars. Stories about standup paddle boarders too hungover to stand on their boards. Stories about farmers pulling guns on the riverbank. Stories about sneaking upriver in the middle of the night to sample bacteria levels. He’s telling me about a guy, a sales rep from Sierra Nevada Brewing Company, who can open a beer bottle with a folded up napkin (“like a ninja”) as we paddle separate canoes down the French Broad River just east of downtown Asheville. 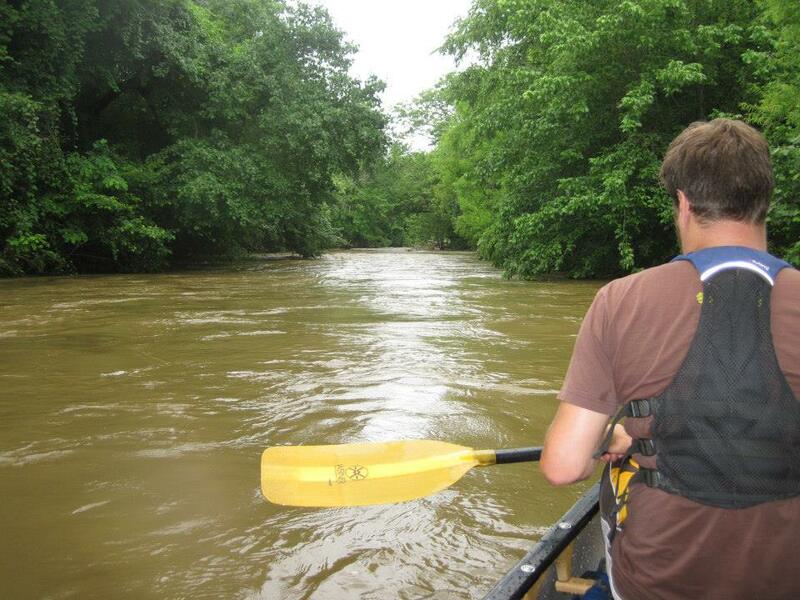 Carson is the French Broad Riverkeeper for the Western North Carolina Alliance. 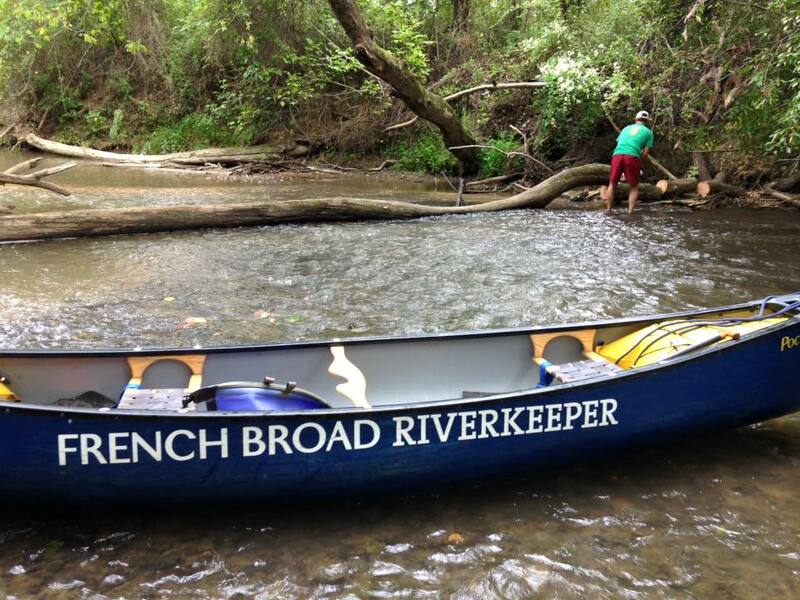 Picture a job where you paddle the French Broad, test water quality, raise funds for environmental protection, and generally try to get people stoked about boating and fishing a river system. 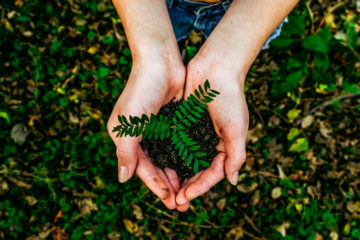 As the Riverkeeper, Carson is the primary protector of the French Broad, a 215-mile river that runs northwest from Rosman to its confluence with the Tennessee in Knoxville. If you’re an angler, and you notice something green oozing from a drain pipe into the river, you call Carson and he gets in his canoe and checks it out. When Carson says “put everything in a canoe,” he means everything. Here’s a rundown of our rations for the two-day trip: A cooler full of Sierra Nevada, one bottle of bourbon, one bottle of champagne, one bottle of orange juice (for mimosas). And that’s just the alcohol. For dinner, we’re cooking apple-smoked chicken sausage with peppers and onions over couscous, and a side of asparagus. In the morning, we’ll have grits and bacon and mimosas. Don’t get me started on the snacks. Or the full living room set complete with a stereo that Carson somehow squeezed into his canoe. Firefighter Island has a winding trail running through its center that connects four or five campsites, a beach with a fire ring, and a composting toilet that Carson built last summer. It’s hard to say you’re roughing it when you have a working toilet, but at the same time, it’s difficult for us to reconcile the fact that we’re maybe seven river miles shy of downtown Asheville. We haven’t seen another boater all day. It’s quiet on the island, which is surrounded by farmland, without a sound other than the rush of the water all around us. And the gangster rap coming from the stereo. Turns out Carson hates jam bands. It’s a secret he’s harbored for decades. He’s a big fan of Tupac, though. The tents go up fast and Palme quickly builds a fire. Then we hit the bourbon. As it gets dark, we keep hitting the bourbon and Kevin falls down in a thick mud pit near the water line, getting stuck for at least seven minutes while Carson and I laugh. The whole evening unravels from there, culminating in an absurd campfire-side discussion of the Biggie/Tupac rivalry. I fall asleep humming Tupac’s “Changes” as the river gurgles a few feet from my tent. 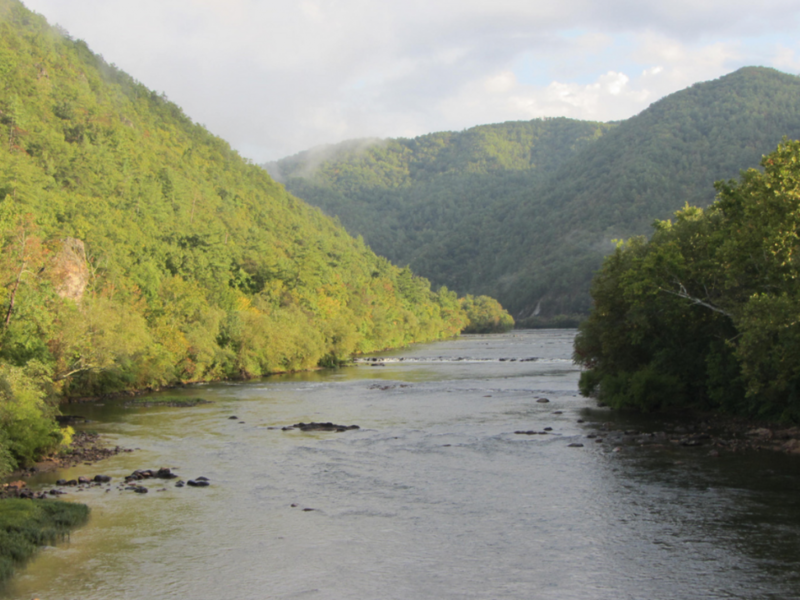 The French Broad isn’t the wildest river in the South. It’s not even close. 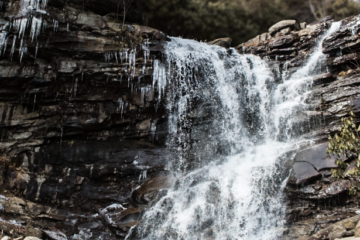 The Big South Fork, The Chattooga—those are primitive rivers cutting through pristine gorges unlike anything else in the South. The French Broad is like a lot of other Southern rivers. It’s pretty, passing through some of the oldest mountains in the world, but it’s been abused. Hopefully, it’s a sign of good things to come. Carson is still concerned about the amount of bacteria in the river. There’s still a good bit of agricultural runoff affecting water quality. And a power plant east of Asheville leaches heavy metals into the groundwater. Keeping the river clean is a constant battle that will have Carson in his boat, sneaking around like Natty Bumppo for years to come, but that’s one of the reasons he pushed so hard to create the paddle trail. 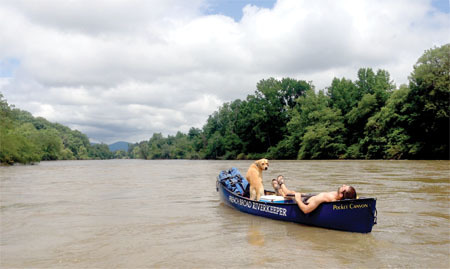 After packing up our bourbon and tents, we continue the languid paddle west toward Asheville. The Biltmore Estate occupies a shocking amount of riverside acres near town, and we see the occasional family riding on horseback through the pastoral backyard of the Vanderbilts. The mimosas and bacon and eggs helped put me in the proper state of mind for a canoe trip, where the biggest concern I have is trying to find a good place to beach the canoe for a bathroom break. None of us are ready for the trip to end when we reach our take out. For a few minutes, we talk about continuing the trip. We could just head farther west past Asheville to the next campsite somewhere downstream for another night. We have a quarter bottle of bourbon left. A few beers. We’ll need food, but we could work that out. Alas, we all have children to go home to. Deadlines and responsibilities. But it’s comforting to know that the opportunity exists. It’s in my backyard. I can hit the river and just keep going for as long as I can take it, or until I run out of booze and food. Plan on nine days to run the whole 140-mile river trail. You’ll paddle the winding headwaters that stretch through Pisgah National Forest then hit easy water and farmland as you make your way towards Asheville. Expect mild whitewater near Marshall and big whitewater on the edge of Hot Springs. Carson’s favorite section surrounds Marshall, where two-miles of mild whitewater lead to Evan’s Island, a campsite in the middle of the stream, followed by three miles of more mild whitewater. Here, the mountains rise straight from the riverbanks. Outfitter: Asheville Adventure Rentals has boats and will run shuttles (ashevilleadventurerentals.com). Upper James River Water Trail, Va.